after going through some application notes for instrumentation measurement I need some expert advice for an analog frontend. The setup is in a stable lab environment and I am not constrained otherwise. As I understand it, the bias resistors should provide a symmetric path to ground form each opamp input. Also, it should be much larger than my 10k source, maybe 5Meg? But low enough no to introduce too much noise. Which is the lowest resistor value I can use to keep thermal noise low and in combination with which opamp? Could I get away with unsymmetrical bias resistors? Can I connect only one opamp input via a low value resistor to gnd and accept the additional offset voltage created at my DUT? For example use low input bias current devices like the AD8220B in case a) and the ADA4530-1 in case b) ? Can you describe what's the characteristics of your sensor? 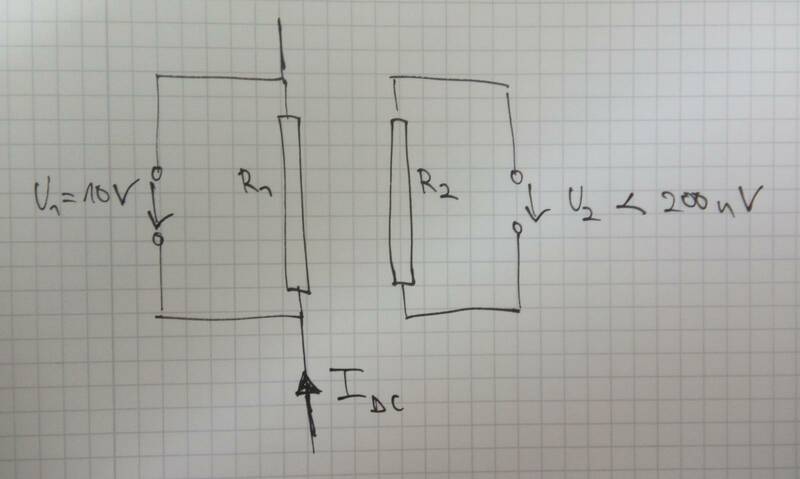 Can it be bias at one end or pull it with high impedance resistor to VCC/2 like the circuit below? The implementation below is enough to provide a DC return path to ground for the floating inputs like the thermocouple. Also, the thermal noise and offset voltage created by ibias*10MΩ will be seen as common mode noise/voltage by the inamp and therefore can easily be rejected by its CMRR performance. 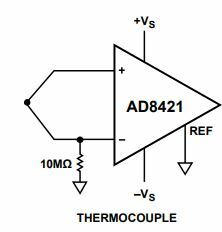 Our lowest noise inamp in our portfolio that you can use are the AD8429 and AD8421. Since you have very wide dynamic range, you might need to add 2nd stage programmable gain and you may want to look at the AD8250/1/3 family. I thought of the AD8429, but was not sure I it will work fine with my R1 = 10k source impedance at 10V. In that case the AD8429 would be in a G=1 configuration. I will lowpass filter with a cutoff at 10Hz. Yes I can do so. But why to VCC/2? Can I connect one end of the resistor to ground via 10Meg as shown on your picture? Sorry for being not clear about my setup. A current source drives a dc current through one resistor. The current direction will be alternated slowly to cancel thermal voltages / offsets etc. By applying an external magnetic field some magic happens and a voltage across a second resistor in proximity is created. As the magnetic field is rotated the voltage changes. The system always has time to reach a steady state. I have to measure both voltages at the same time.